The 52 Story Treehouse, by Andy Griffiths, a fantasy book for kids, is Australia's Book of the Year. 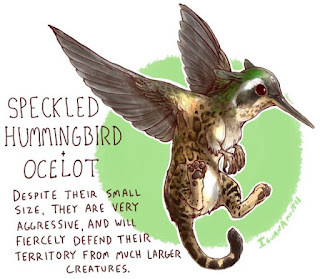 Found via Tor--wonderful griffins made from unexpected cat/bird mashups. And finally, I hope you all have marked your calendars for Kidlitcon 2015! (Oct 9th and 10th, Baltimore). The call for session proposals is up--please feel free to get in touch with me (in my role as program coordinator) if there's a topic you'd like to speak about, but you feel uncertain about getting a whole panel organized! And see all these books I brought back from BEA? Lots of them are going to travel back down the East Coast with me again in October for the Kidlitcon ARC swap.....because carrying impossibly heavy suitcases is a Good Hobby. I saw you working on your Sunday post at Kidlitcon, so I know you always do a thorough job. For as much middle grade fantasy as is out there, however, you would think there would be more reviews! I've noticed that a lot of my blog feed now is stuff other than reviews, though. Hmmm. Must go read. Getting too contemplative! Congrats on the B&N post!